within riding distance, of course. We loved him and he loved us children. One, Two, Three, Four, Five, Six. I remember well one birthday party, where my father lifted six of us loud, crazy children up onto the back of Red. He allowed us all to be there, patiently walking around with us on his back, like a grandfather patiently allows his grandchildren to crawl all over him while he lays sleeping peacefully on the floor. Red transported us happily. We were his friends. Transportation. Red was our transportation. He took us to the swimming hole. He took us to the field of peas. He took us to the old “haunted” shack down the road. He took us on picnics. He took us on many adventures. He took us to find friends. If ever we wanted to play with friends, within a 5 mile radius, (or so it seemed) we rode Red. 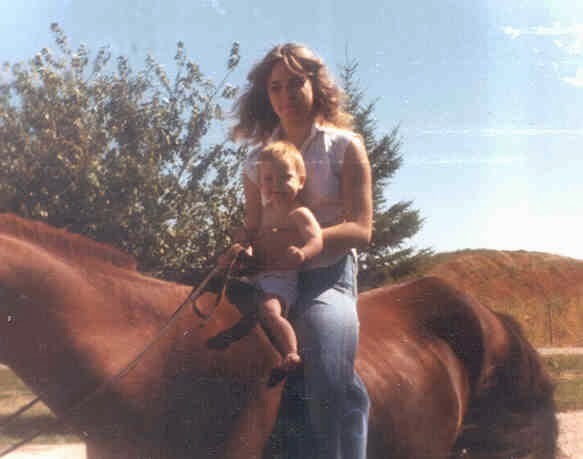 We would ride to the neighbor's home, pick up a kid or two, and sometimes another horse, and then off to the races. The races. We had many a races, out there in the wide open fields. Races with other horses. Races with imaginary horses. Races against the wind. Races with my hands held high in the air to feel the warm summer breeze, my hair flowing wildly behind me. Nobody out there to slow us down. Not a care in the world. Reins loose and free. Reins. Yes, we had to use these, but only these. We learned young how to put these on Red, but rarely a saddle. Red preferred we go bare back, and that is what we did. After all, we were too little to put on a saddle, we couldn't even lift one up. We would simply put a rope around his neck, lead him over to the fence where we could climb up high enough to put the reins on him, and then hop from the fence onto his back. Yes we were big, but still oh so little. I don't remember a time when I wasn't allowed to ride Red. We were jockey's at five years old. Jockeys. We raced. We jumped ditches. We herded cattle. We ran in and out, zigged and zagged between the trees. Red knew us well, and we were one with him, as we sat high up on his back. It was the life of a farm kid, back in the days of black and white. Ooops, I mean back in the '70s. I sometimes long for those peaceful, carefree summer days. Just a girl and her horse. A wide open field. A world of adventure awaiting, and all day to discover it. That was the life. That was the best. That was perfect. That was my life!